Basil is many a cook’s favorite herb and I am no exception. With a subtle peppery taste that evolves into a sweetness and lightness accompanied by a delicate menthol aroma, well, it’s no wonder ‘basil’ comes from the Greek word “basileus,” meaning king! There are many different cultivars of basil, but one of my favorites is the Boxwood basil plant. 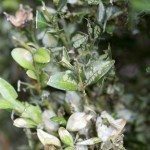 What’s Boxwood basil? Read on to find out how to grow Boxwood basil and all about Boxwood basil care. As its name suggests, a growing Boxwood basil plant looks much akin to boxwood. Ocimum basilicum ‘Boxwood’ is a highly ornamental basil. This compact, round, bushy basil looks fabulous as a fragrant edging around the garden, in containers, or even trimmed into topiaries. Boxwood basil grows between 8-14 inches (20-36 cm.) wide and tall. It is suitable in USDA zones 9-11. Like other basil varieties, Boxwood is a tender annual that likes both warm air and soil. Start seeds indoors 3-4 weeks prior to the last frost in your area in a good quality starting medium. Lightly cover the seeds and keep them moist. Germination will take place in 5-10 days at an optimal temperature of around 70 F. (21 C.). Once the seedlings show their first couple of sets of leaves, move the plants to bright light and continue growing Boxwood basil until temperatures have warmed enough to transplant them outside. Wait until nighttime temperatures are at least a consistent 50 F. (10 C.) or over. 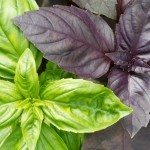 When temperatures have warmed enough to move the basil outside, select a site with full sun and well-draining soil. Keep the basil damp but not sodden; give it about an inch of water each week depending upon weather conditions. If the Boxwood basil is container grown, it may need to be watered even more frequently. Leaves can be harvested throughout the growing season. Continually pinching the plant back will result in additional leaf production and a bushier plant.